The Legends head to 1988 when they discover that an anachronism has killed Ray Palmer as a child. The threat turns out to be a baby Dominator and the government agents who will kill to keep its existence quiet. At the same time, Jax and Rory team up to figure out the secret Stein seems to be keeping from the team. The show's uneven rules regarding how quickly changes to the past are reflected in the future continue, with Ray vanishing instantly after his younger self dies in 1988. In the first season and early half of Season Two, changes to the past were gradual things, such as Professor Stein losing his wedding ring but retaining his memories when events stopped his past self from attending the mixer where he met his wife or slowly developing memories of his daughter after his actions caused his past self to father a child. From 209 onward, it seems that the changes are instantaneous, such as George Lucas suddenly deciding not to make movies causing Ray and Nate to lose their knowledge because they never got inspired by Star Wars or Indian Jones respectively. It's a minor point, but one wonders why the physics-minded Professor Stein would have been a "National Geographic boy" rather than a Scientific American reader unless he was reading it for the pictures of the naked native women - many a nerdy lad's first exposure to the glories of the female form. Sara seems to refer to herself when she talks about The Dominators making the metahumans fight each other. Unless something changed the last time Barry time-traveled, Sara does not have any metahuman powers unless dying and being resurrected gives you honorary metahuman status. Stein's secrecy in going behind the team's back to communicate with his daughter is the worst kind of contrivance. There's no good reason why the rest of the team wouldn't support his making a trip to see his grandchild be born. Stein's excuse that he didn't want the team to think he wasn't committed to their cause doesn't ring at all true and the only reason for his doing what he did the way he did it is to spur drama and remove The Waverider at an inopportune time for the rest of the team. It's sloppy writing any way you slice it. Why did The Dominator Queen try to seduce and attack Nate when it should have known, from reading Sara's mind, that he was trying to help find her child as well? Tala Ashe turns in a great introductory performance here, fleshing out what we saw of Zari in the previous episode now that she isn't as guarded. She shows great chemistry with Brandon Routh and the best moments of the episode involve the two playing off of each other. The CGI for the baby Dominator is surprisingly good for broadcast TV. For as brief as it is, the musical sequence is well choreographed. The episode's opening narration is read by Professor Stein. This episode originally aired on Halloween Night - October 31, 2017. The city of Ivy Town is Ray Palmer's hometown in the original DC Comics, where it is a college town somewhere in New England. In the DCTVU, Ivy Town is a peaceful suburb, somewhere near Star City, where Oliver Queen and Felicity Smoak briefly lived together for several months. Martin Stein taught at Ivy Town University in the 1970s and met his wife there. Surprisingly, there is a precedent for hardened criminals in The DC Comics Universe appreciating fine musical theater. In Starman #14 - of the 1990s cult-hit Starman series - two gangs of thugs argue as to which is the best Sondheim musical - Sweeney Todd or Into The Woods. They are all gunned down by crooked cop Matt O'Dare, who, following a vision that inspires him to reform his wicked ways, declares that Sunday In The Park With George is the best Sondheim musical. The costume which Zari dons for the first time in this episode is inspired by that of The Mighty Isis - a heroine originally created for the 1970s children's program The Shazam/Isis Hour which also starred the Billy Batson version of Captain Marvel a.k.a. Shazam. Ray reappears despite the newspaper saying he is dead due to temporal permanence not having set in yet. Gideon says that infant Dominators have all the strength of an adult Dominator but no sense of discretion. It also has the ability to mind-control people. Nate notes that adult Dominators are capable of telepathy and ripping a human apart with their bare hands. Dominator Queens have the power to create mental projections, supplanting thoughts and sensations into a victim's mind. The US Government in the 1980s had technology capable of neutralizing a Dominator's powers by suppressing its neural impulses as well as preventing it from contacting its mother. The Dominators are apparently an insect-like species, where only a female Queen gives birth. The Dominator Queen - and perhaps adult Dominators in general - has the power to generate a sticking webbing for holding captives. It uses this to adhere Sara to a piece of playground equipment. Stein built a trans-temporal communicator so he could keep in touch with his daughter and be assured of being there when his first grandchild was horn. Ray: Step One, Part One - Icebreakers. Jax: Dude, we've been stuck on a ship that has one bathroom. I think we know each other well-enough! Zari: I've already have you all figured out. The old guy wants to be anywhere but on this ship. These two (gesturing at Amaya and Nate) have some "will-they, won't-they" thing going on. Rory has been drunk since breakfast. Jax is wondering if I'm single. And your ship is still mad at me for doing a teeny hack on her sub-systems. Now what's this about one bathroom? Ray: Yeah. Singing In The Rain. Only the best musical ever! Rory: Not as good as Fiddler On The Roof. Rory: I love that show. The entire musical sequence of the baby Dominator making the government agents perform Good Morning from Singing In The Rain. Nate: I'm not crying. I just have alien goo in my eye. Nate: Now I'm going to go brush my teeth forever. Nate: Woah. It's like E.T. Ray created a ten-step team-building process. The Waverider only has one bathroom. Ray was born in 1980. 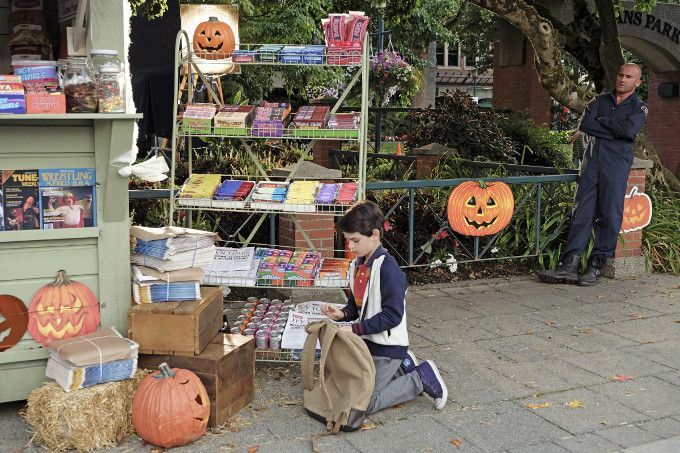 In the new timeline, Ray disappeared on Halloween 1988. His body was found two days later in the woods near his home. Zari is left speaking French after her first time-jump. Ray read Scientific American as a boy. Stein comments that he was more of a National Geographic boy. The team discovers that Ray found a baby Dominator and has started stealing candy to feed it. He calls it Gumball. The Legends faced The Dominators in 207. Ray comments that he and his brother Sydney used to fight over their Nintendo Entertainment System. He wanted to play The Legend of Zelda. Sydney only wanted to play Tecmo Bowl. Zari says the only video games she had growing up were military training simulations. Zari has never heard of the musician Billy Joel. Nate is a Billy Joel fan and considers his Beatles tribute album Nylon Curtain his best work. Ray's favorite musical of all time is Singing In The Rain. Rory says Singing In The Rain is not as good as his favorite musical, Fiddler On The Roof. Both Nate and Rory think Ray's mom is attractive. Ray's mom had to leave work once that month already after Ray set the school science lab on fire. Ray had a habit of finding stray animals and bringing them home as a kid. Rory discovers that someone has been using the jump ship to make secret trips while everyone else was asleep and erasing the logs. He suspects Stein is selling The Legends out to The Time Bureau. Amaya tells Nate she just wants to be friends. Jax and Rory discover that Stein has been rearranging one of the storage rooms on the lower deck into a lab, where he build some kind of transmitter that can send a signal through time. Young Ray has a secret fort out in the forest behind his home that he named Camelot. This is a reference to Ray's dreams of being a knight as a boy, which were first mentioned in 212. It is revealed that Stein's secret trips and communicator were all part of his efforts to keeps tabs on his daughter's pregnancy so he could be sure of being there when his first grandchild was born. Lily Stein gives birth to a healthy baby boy. He is named Ronnie - presumably after Professor Martin Stein's first partner as Firestorm, Ronnie Raymond. Sara is seen in a new white jumpsuit as White Canary. Zari dons a white and gold costume to appear with the rest of The Legends when taking young Ray trick-or-treating. In Zari's time, The FDA outlawed candy. Zari says - playing Two Truths And A Lie with Ray - that her friends used to call her Z, that she loves musicals and that she once got a hold of a copy of The Legend of Zelda but never beat the final boss. We never find out which was the lie, but based on her reaction when Ray says he wants to watching Singing In The Rain with her, it's probably that she likes musicals. Jax asks Ray for his help in finding a way to break-up The Firestorm Matrix so Stein can retire and go back to Central City 2017 without him. Averted with style, as Zari proves herself vital to the team immediately and just as sensible as Sara and Amaya. It's goofy as heck and far more concerned with making references to various 80's films and winking to the audience than telling a thrilling story. (I'm honestly amazed they didn't go for the Ghostbusters 2 homage with Sara waking up in the webbing and asking "Why am I dripping with goo?") The script is contrived and requires the smartest members on the team to act like idiots and the last people who should be keeping secrets from each other to try doing so. Get past that, however, and it's a fun little ride.